Location/ Directions: I-45S- Exit 1C left on Harborside Drive, 1 Block on left. About Hotel: 2-Floors, 46-Rooms, Exterior Corridors, High Speed Internet Access, Business Center, Outdoor Parking, No Pets Allowed, Free Continental Breakfast, Wi-Fi, Refrigerator, Microwave And Desk. Railroad View: Excellent View! All rooms that have a rear (north side) facing window will offer a railroad view. 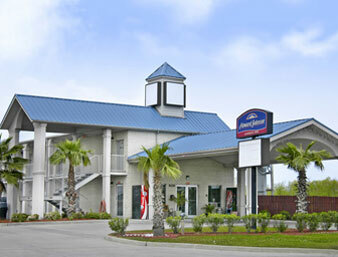 From this motel, you can see all three rail lines that come off the single track Causeway Lift Bridge. The track closest to the motel is Union Pacific (ex. MP/MKT) which you will have a prefect view. The other two lines (BNSF / UP-SP lines) should offer a fair view from 2nd floor rooms. Tress and traffic on Harborside Drive may foul a good view of the farther two rail lines. Railroads past Hotel: The track closest to the motel is Union Pacific (former MP / MKT, originally GHH = Galveston, Houston & Henderson RR). A few hundred feet north is BNSF Railway (former Santa Fe), and just north of that is another Union Pacific (former SP line). Galveston isn't the busiest train watching place in Texas, but sees its share of road trains due to the Port of Galveston. 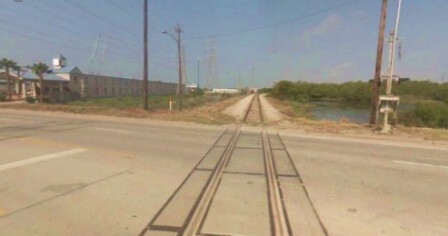 Photo Comment: The Google Street View looks west down Union Pacific's former MP / MKT line. The Howard Johnson Motel is seen to the left with a clear view of the railroad. A few hundred feet to the right of this photo are the BNSF and UP-SP railroad lines. All three tracks should be seen from the motel.